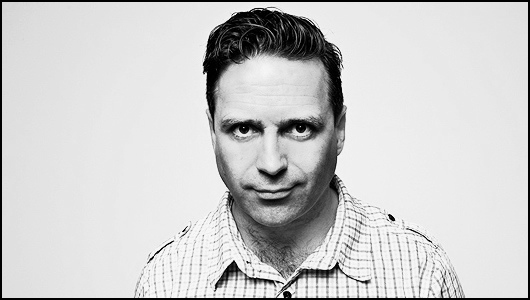 Rants is the name, and frothy-mouthed tirades are what Phil Nichol duly delivers in this tough-to-like hour of stand up. Nichol’s pedigree (2 Perrier nominations, 1 win) marks him as a man with some great comic and structural ideas, but with this show he fails to hit the mark with much of the content. Before the show begins, Nichol welcomes every audience member in personally and has some fun with latecomers, refusing to start things before he is sure all the seats are full – and having the audience clap and cheer late arrivals to their seats. It’s a bright and cheerful start to proceedings but once the show started proper I found things much tougher to take in. Kicking things off, his first rant starts with the Canadian comic’s dislike for the world of PR spin and how nothing is as straightforward as it used to be. Using a packet of Salt and Vinegar crisps as his example, he goes onto rail against the world we live in where Suffolk Cider Vinegar and Irish Sea Salt potato snacks are the norm and everybody has an option on everything. There are a couple of nice ideas thrown in but too much of the show consists of a middle aged man highlighting things that have changed and asking, ‘What’s up with that? !’ – repeatedly. Most of the material here is shtick you’ve heard before, on fairly pedestrian topics under the theme the changing modern word, with too few actual punch lines to really elevate it above the ordinary. Material aside, my main problem with the show was with the delivery and Nichol’s comic style. Clearly a very versatile performer, he yelps his exaggeratedly furious rants at 100 miles per hour, covering the front rows in spit and leaping about the stage with a whole range of manic and disbelieving expressions on his face. It’s exhausting enough for the performer but was simply too much for this reviewer to stomach over the course of an hour, as Nichol frequently delivered unintelligible lines where his eagerness to rail against the next thing on his list saw jokes garbled. Towards the end the grating delivery and baffling pace was referenced by a visibly shattered Nichol, but for me this frothing delivery undermined some of the stronger material he did have. Routines about tabloids in the UAE, UN ambassadors and the perils of guessing a woman’s age are all well observed with strong punch lines but felt lost and isolated in the barrage of noise around them. The final minutes of the show saw things pick up as Nichol slowed the pace and played with the room, turning the whole audience/act relationship into a dysfunctional breakup, leaving and re-entering several times, fiddling with the received wisdom of how to end a show. It’s an interesting idea but one that only serves to shine a light on the lack of really inventive notions in the majority of the show’s actual material. Date of live review: Thursday 23rd August 2012.